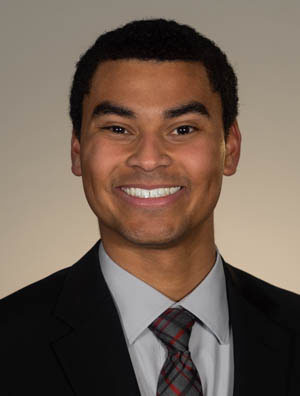 Alex Countee joined the ABC 57 First Warning Neighborhood Weather Team in June 2017. He is the weekend morning meteorologist, where he does on-air forecasts from 6 AM to 8 AM as well as Noon on Saturday and Sunday, and also a weather reporter during the weekday morning shows from 5 AM to 9 AM on ABC 57 and the CW 25. This is Alex’s first job after graduating from the University of Missouri-Columbia in May 2017 with a degree in meteorology. He is originally from Kansas City, Missouri, but he’s excited about living in a new place outside of his home state. Alex first became interested in the weather as a child after a powerful ice storm knocked out power in his hometown for a week during the winter of 2001-2002. Ever since, he has been fascinated with both winter and severe weather. He also became interested in the broadcasting side of the science and eventually went on to intern at KOMU-TV in Columbia, MO and KMBC-TV in Kansas City. Now that he is here in Michiana, he is very excited to start the first steps in his meteorology career. Outside of the weather, Alex enjoys playing baseball or softball, running, music, being with family and friends, and, of course, eating all kinds of BBQ! You can connect with him via email at acountee@abc57.com, or follow him on Facebook and Twitter. How similar are the spring and summer seasons? Can we still see snowfall in April? Severe weather awareness: Get your plan ready! Will the warm-up boost the bugs? Did a "frost quake" hit Michiana? A snow-less December but what about January? Hair Ice: What is it and how does it form?